Get 15% off all Diamond Engagement Rings. Todays Black Friday and now through Monday enjoy an extra 10% off Brilliance.coms already low prices on engagement rings, wedding bands, and jewelry. Be sure to use Coupon Code BLACK at checkout at http://www.brilliance.com. Offer expires 11/29/2011. 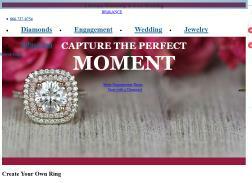 Get 10% off Engagement Ring Settings.